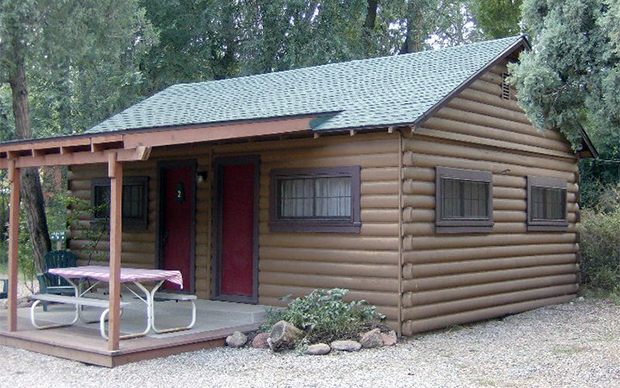 Cabin #2 is a separate cabin with one bedroom and one living room. 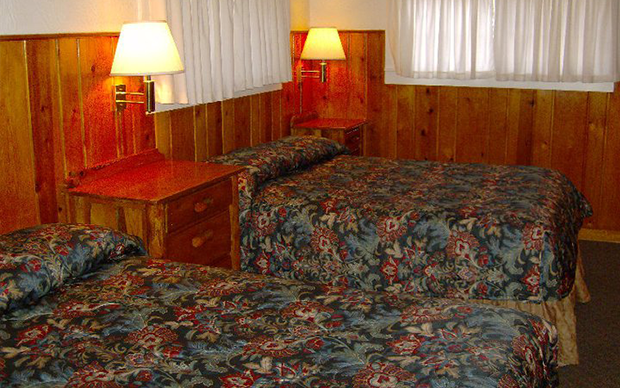 The bedroom has two double (Full Size) beds. 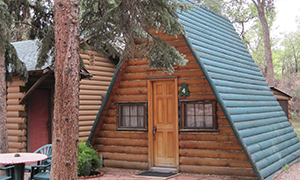 This cabin has two small bathrooms with showers only (no tubs). The main room has a combination living room, dining table, and kitchenette. The living room has a futon which is a couch that folds flat into a full size mattress. 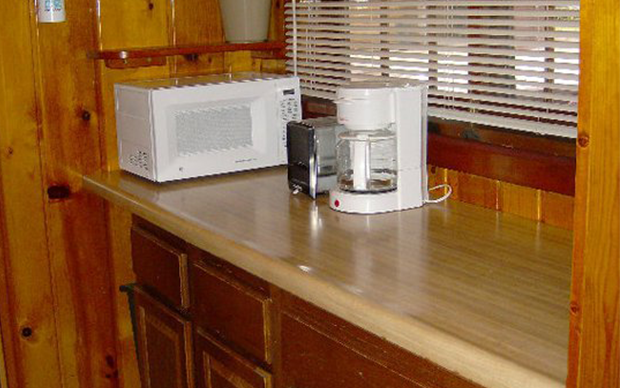 There is a fully stocked kitchenette which has a two burner electric stove, a waist high fridge, and a microwave oven (no regular oven). 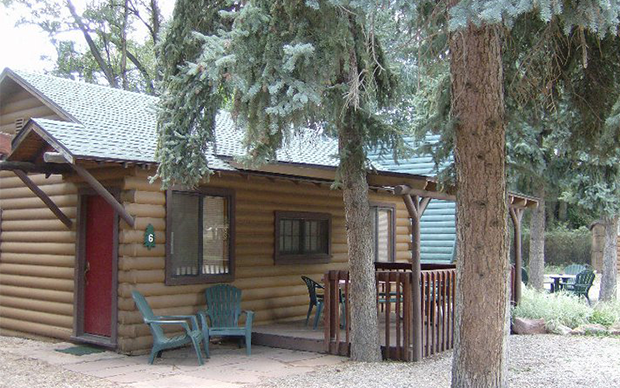 There is a covered deck on the front of the cabin with a picnic table. 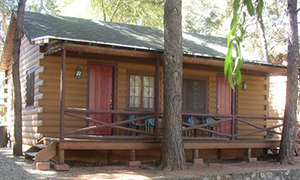 Cabin #6 is a separate cabin with one bedroom and one living room. The bedroom has two double (Full Size) beds. This cabin has one bathroom with a tub/shower. The main room has a combination living room and kitchenette. The living room has a futon which is a couch that folds flat into a full size mattress. 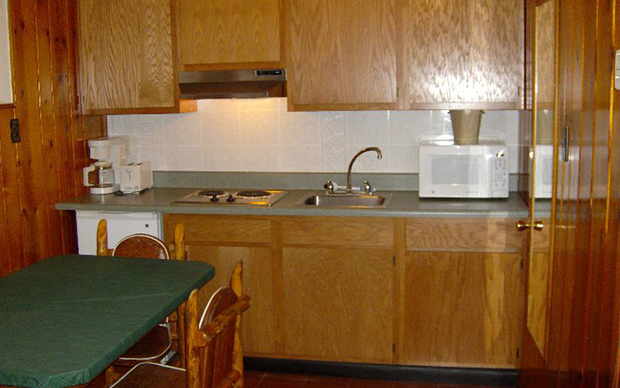 There is a fully stocked kitchenette which has a two burner electric stove, a waist high fridge, and a microwave oven (no regular oven). 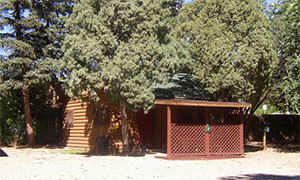 This cabin does not have an indoor dinette set, but there is a large covered deck on the front of the cabin with a picnic table. 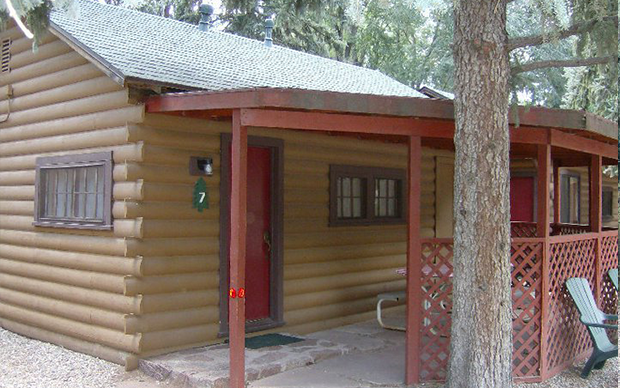 Cabin #7 is a separate cabin with one bedroom and one living room. The bedroom has two double (Full Size) beds. This cabin has two small bathrooms with showers only (no tubs). 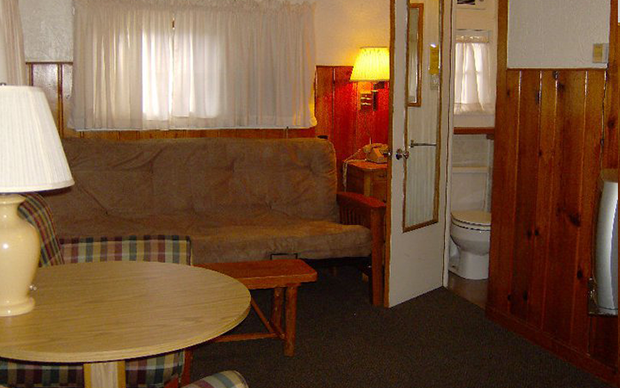 The main room has a combination living room and kitchenette. The living room has a futon which is a couch that folds flat into a full size mattress. 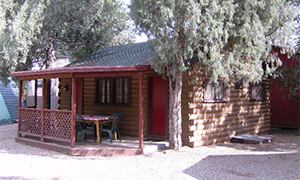 There is a fully stocked kitchenette which has a two burner electric stove, a waist high fridge, and a microwave oven (no regular oven). 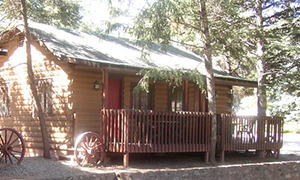 This cabin does not have an indoor dinette set, but there is a large covered deck on the front of the cabin with a picnic table. 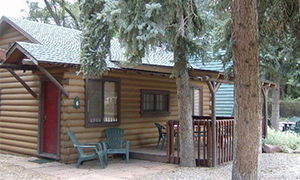 Cabin #11 is a separate cabin with one bedroom and one living room. 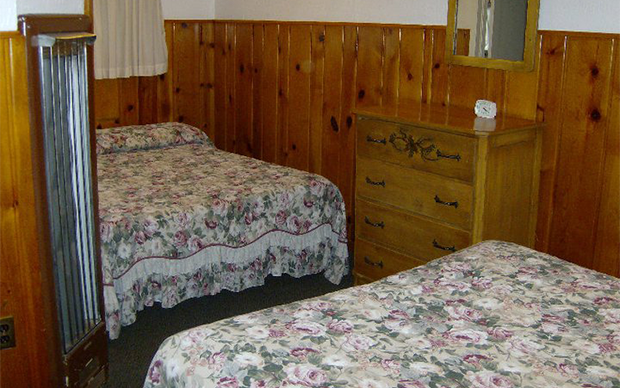 The bedroom has two double (Full Size) beds. This cabin has one bathroom with tub/shower. The main room has a combination living room, dining table, and kitchenette. 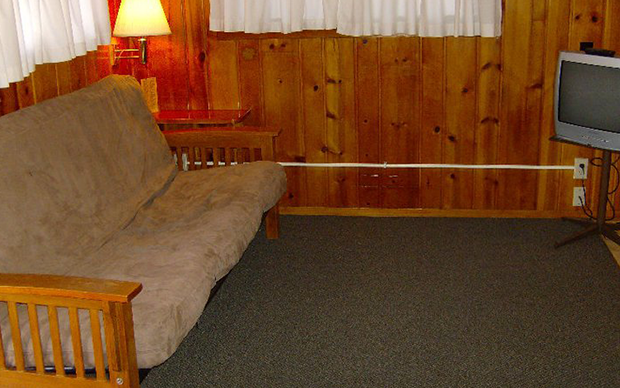 The living room has a futon which is a couch that folds flat into a full size mattress. 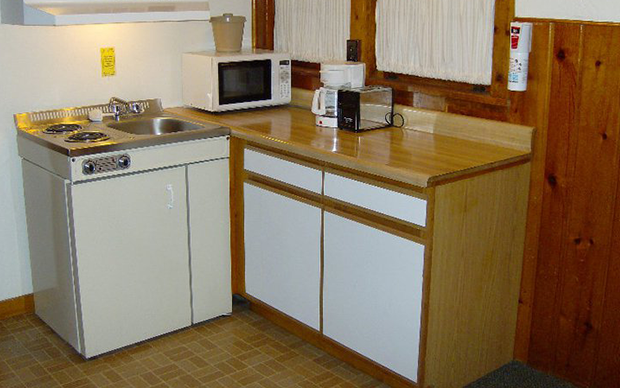 There is a fully stocked kitchenette which has a two burner electric stove, a waist high fridge, and a microwave oven (no regular oven). 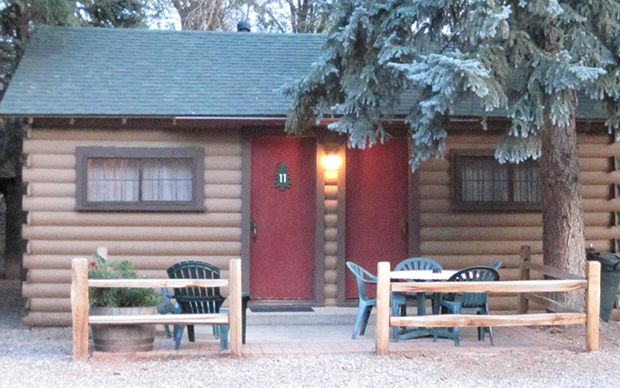 There is a fenced in patio area in front of the cabin with a picnic table and lawn chairs. Copyright © 2018 Timber Lodge.